One of the many reasons why I love Melbourne is that we are constantly included in various food events (hence why my waistline is constantly expanding). 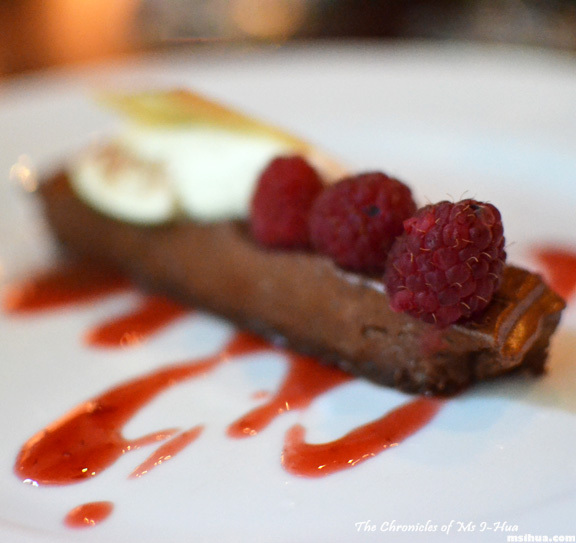 The most recent and current food event is the Wellington Pop-Up restaurant located in Fitzroy (from 15 – 27 November 2011). 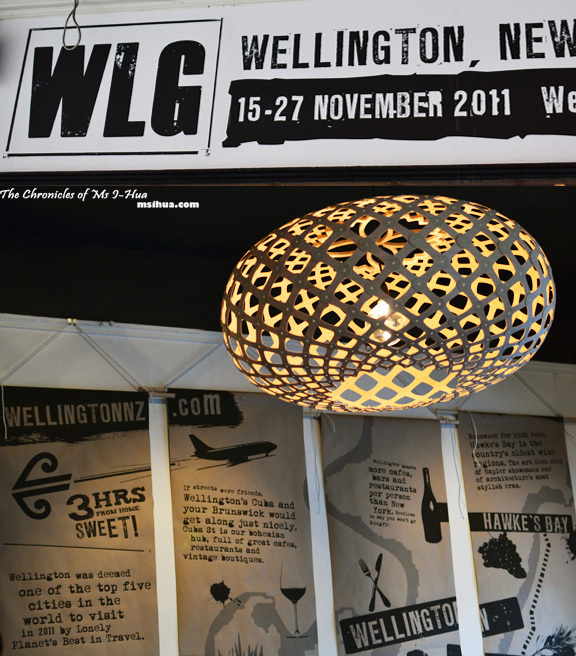 The point of this WLG event is to showcase and highlight the amazing produce and quality of food that is found in the Wellington region (in New Zealand) as well as to promote their many food and wine events from now until March 2012. The fact that it was exceptionally good value was a bonus! $35 for a 3-course meal, it was a steal! Although it was a miserably wet and windy day on the Saturday we attended the dinner, Agnes, Thanh, Alastair, Agnes’s brother, the Boy and myself entered the WLG pop up restaurant with enthusiastic excitement. 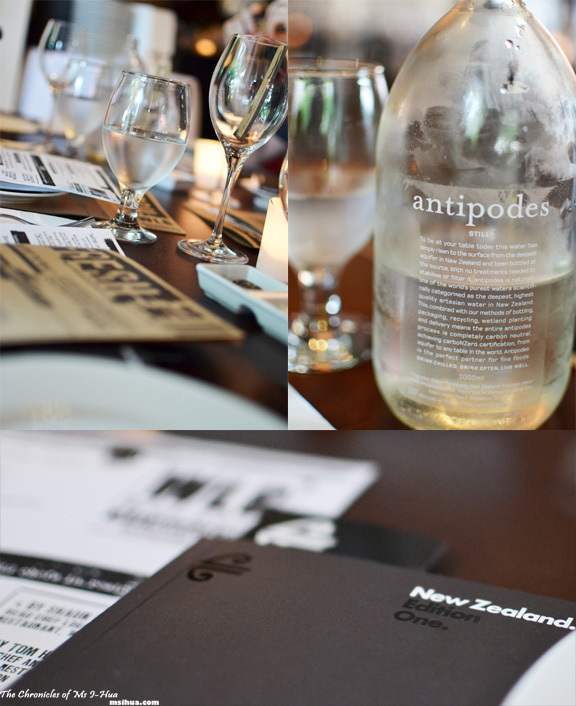 As we sipped our Antipodes still water, our waiter kindly informed us that the drinks would be maintained at a very reasonable price structure, with $7 a glass (of anything) and $30 for a bottle of wine (any wine). To start us off for the night, Thanh, Agnes and I ordered a couple of cocktails. Agnes and I had the rather cordial tasting Twistless Twist (Lavender’s Green Lemon Cordial & Antipodes Sparkling Mineral Water served over ice & fresh lemon) whilst Thanh had the Capital Collins (42Below Vodka & Lavender’s Green Lemon Cordial stirred into a flash of Antipodes Sparkling Mineral Water, ice & a squeeze of fresh lemon). 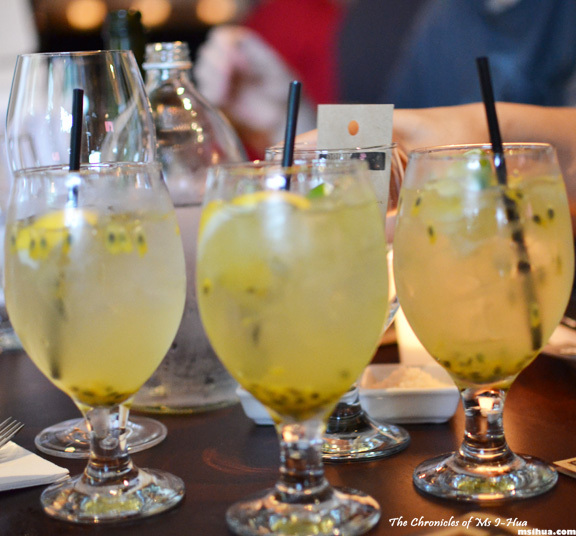 Both were served with an added passionfruit zing! For the entree, we received two sharing plates (there were 6 of us) and we launched an immediate assault and won the battle. 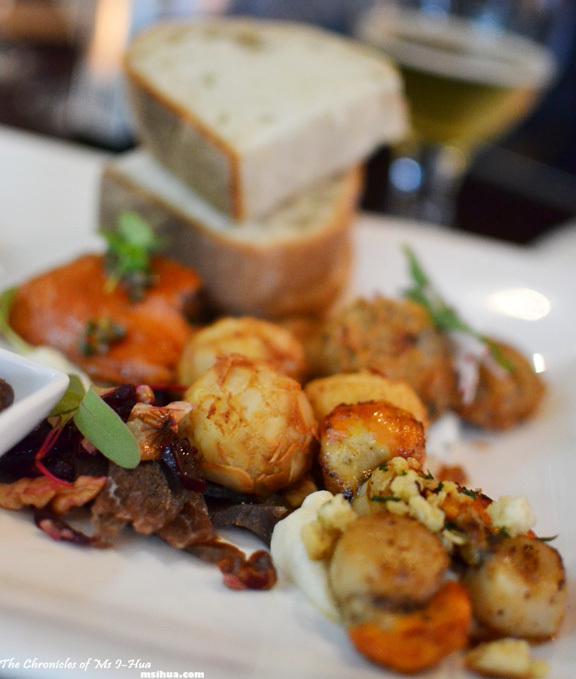 My favourite was definitely the melt-in-your-mouth pig’s cheek and the fried goat’s cheese balls. As for the Boy, he proclaimed the scallops as the winner. There were also some very zesty and peppery olives on the plate which were absolutely amazing! Truth be told, I think Alastair, Agnes’s brother and I had the winning dish of the night! 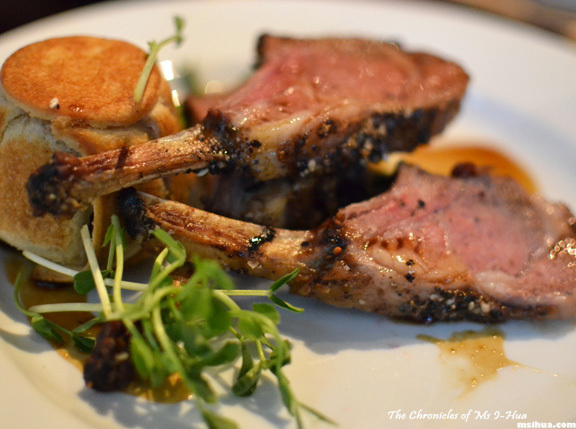 Beautifully Braised Lamb Shoulder Timbale (with dukkah-crusted lamb rack & wilted mixed greens with thyme & garlic braising liquor) cooked perfectly. Tender and moist, I truly enjoyed this dish. Thanh and Agnes both had the Slow-cooked Venison in Tunisian Brik Pastry (with veal sweetbreads , broadbeans, peas & pancetta) which looked really good. I swapped a bit of my lamb for a bite of Thanh’s venison and quite enjoyed the taste of it. That being said, I did think there was a little too much salt in the seasoning of the venison. 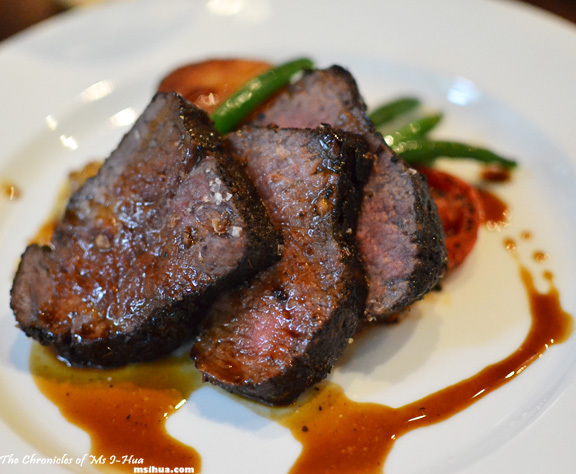 The Boy was the only one who went with the Horopito Seasoned Beef (with slow roasted tomato, potato fondant & green beans). He thought that the beef was beautifully cooked with a nice crust on the outside. As for the sides, the slow-roasting brought out the sweetness and intense flavour of the tomato. Yum! Potato fondant was smooth and made a great accompaniment to the dish. And then we were on to desserts! As there were two options to choose from, the Boy and I obviously decided that we would have both options! Duh! 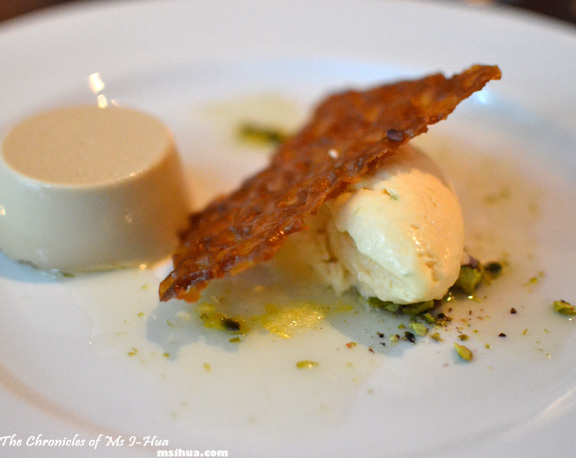 I had the tangy Licoricello Panna Cotta (with vodka lime parfait & pistachio wafer) which was very refreshing and creamy all at the same time. Loved the pistachio wafer and the wonderful lemon syrup it came with. Rex Morgan: head chef at Boulcott Street Bistro, and one of the select few chefs to have won all of New Zealand’s culinary awards. Shaun Clouston: head chef at Cuisine Magazine’s Restaurant of the Year 2009, Logan Brown, one of the signature venues on Wellington’s eclectic Cuba Street. 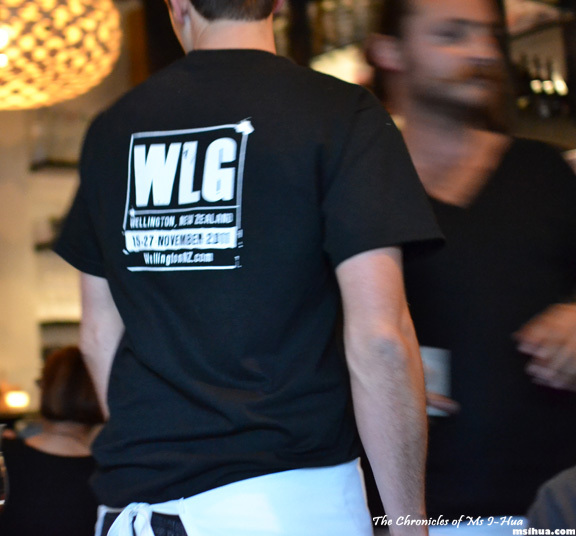 Shaun spent five years in Sydney in the early 2000s, cooking at La Grillade, and Wildfire. Jacob Brown: owner of one of the hottest new restaurants on the Wellington menu, The Larder, located in the heart of the city’s film studios in Miramar. 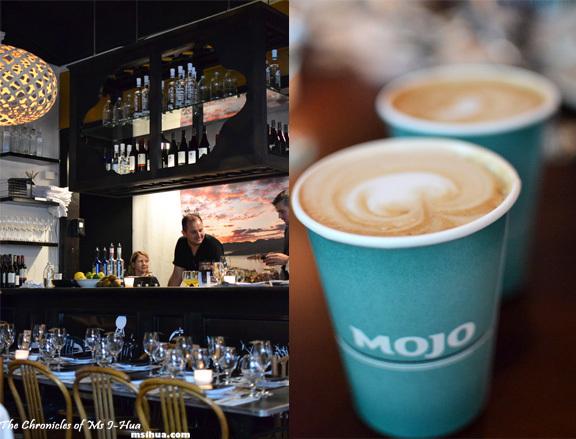 Jacob previously worked at Sydney restaurants Tabou, Hyde Park Café and Fuel Bistro. Tom Hutchison: head chef and owner of Capitol, one of the Wellington’s most successful restaurants. Terry Lowe: head chef at Black Barn Restaurant and Vineyard, Hawke’s Bay voted by Cuisine Magazine as New Zealand’s best winery restaurant in 2011. Food Producers Involved: Regal King Salmon, Mojo Coffee, Whittaker’s Chocolate, Lot Eight Olives & Olive Oils, Damson Collection, Lavender’s Green, Telegraph Hill. All in all, it was an amazing snapshot of the food in Wellington. It helped, to dine with people who were originally from there, *looking at Agnes and companions* and I can say for sure that if I ever do end up in Wellington for a visit, I wouldn’t be worried about the quality of the food! 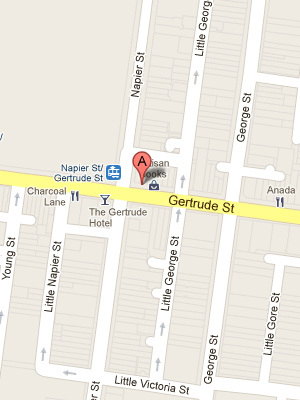 Price: $35 for a 3-course meal (shared platter, main course, dessert, coffee/tea). NZ Wines available at $30 per bottle or $7 per glass. Tickets: Tickets are sold out. But limited walk-ins are available each night; outdoor seating available (no advance tickets) if weather permits. yummmm I wanna go back!!! I’d still order yours first, though! It’s true. I was born wearing crankypants. I read fried goat’s cheese balls as fried goats ball. 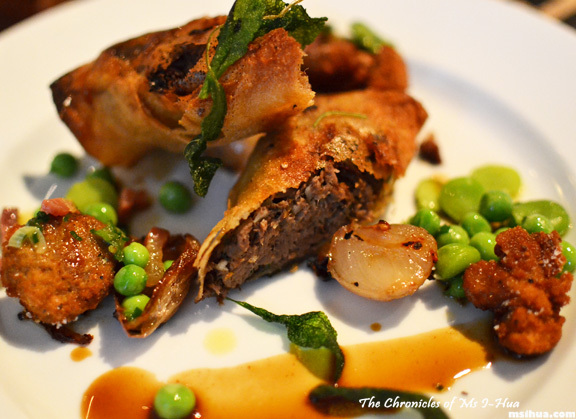 Michelle chin recently posted…Review: Early Lunch @ St Ali, South Melbourne. Your pictures are so beautiful!!! I absolutely agree! The goat’s cheese was amazing!! Speaking of which, the only time you haven’t tried stealing from my plate was yesterday at VDM! 1.5 days to go Allan… 1.5 days!!! I like your selection of food to take pictures of. They all look so attractive. I hope I get to taste their lamb soon. Thank you for the recommendation. Glad that it worked then! It was such good fun! It was such great value huh?! Loved loved loved loved loved the lamb and the choc pavi. p.s. I’ve linked you up! Adrian (Food Rehab) recently posted…What do Salt n Pepa and the WLG Wellington Pop-up Restaurant in Fitzroy have in common? So jealous you went twice! It is like a torture looking at these foods but cant eat it right away.